Octinoxate (3%) and Zinc Oxide (11%). C20-40 Alcohols, Cetyl PEG/PPG 10/1 Dimethicone, Cyclohexasiloxane, Cyclopentasiloxane, Cyclotetrasiloxane, Dimethiconol, Glycerin, Hydrogenated Castor Oil, Magnesium Chloride, PEG-30 Dipolyhydroxystearate, Polypropyl Silsesquioxane, Purified Water, Tridecyl Neopentanoate, Triethoxycaprylylsilane, Trimethylsiloxy Silicate, Ubiquinone (Coenzyme Q10). Doesn't make eyes sting Doesn't irritate sensitive skin Zinc-based No scent Takes longer to apply Can give skin a whitish glow This is the main sunscreen I use for long hikes in the Arizona sun. It's a slightly thicker consistency than some are used to and requires more effort to rub into your skin than popular name-brand sunscreens (likely because it doesn't contain as many chemicals and parabens). It may even give your skin a bit of a whitish glow at first, but this seems to gradually fade. 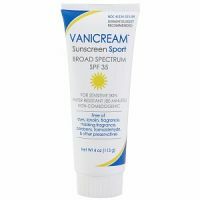 It is the only sunscreen I've ever used that doesn't make my eyes sting when I start sweating and rubbing around my eyes. It doesn't even hurt to put on broken/healing skin. Yes, the packaging leaves something to be desired and it can be difficult to find. I try to buy it when it's on sale at [link removed], but it's also available in some Walgreens. Formulated with transparent zinc oxide and octinoxate (formerly called octyl methoxycinnamate) Non-comedogenic Free of PABA and benzophenones Non-greasy, long-lasting Oil-free Odorless Can only find behind pharmacy counter at Target Little bit expensive, but worth it. Takes awhile to soak in. You get the coverage with the zinc. It's very good for sensitive skin, I'm one of those people that break out even when my skin is a little bit irritated. I also get a lot of hyper-pigmentation. When I say it takes awhile to soak in, it might stay a little white but looks fine about 15 minutes later. Will give a little glow, but if you wear makeup it looks just fine. I use bareminerals/or liquid makeup and it looks great with both. Haven't tried the non-sport kind, will be trying the 60 spf soon but the 35 spf works great in the Arizona sun, that's saying a lot. So hard to find a sunscreen with zinc that doesn't cause breakouts, this works for me!! !